Special stamp issues have frequently celebrated the best of British. From high literature to artistic achievements, Royal Mail designs have been used to celebrate the cultural influence of the UK’s authors, illustrators and painters on the rest of the world. Now, it is the turn of comics with the announcement that a series of superhero special stamps will be available in March 2019. Britain has had a long association with the production of comics loved by children (and adults) across the globe. It was in the 1930s that Dundee-based publisher DC Thomson created The Beano and The Dandy. The former title is Britain’s longest-running children’s magazine and is expected to reach 4,000 editions in 2019. Meanwhile, following the success of the Marvel comics in the US (previously known as Timely Comics), Marvel UK was established in 1972 – with the aim of repurposing stories from characters such as Hulk, Thor and Spider-Man for a British audience. And in 1976, Captain Britain Weekly was launched. With its tales of adventure and daring, the Marvel superhero devised solely for UK readers, may have been short-lived but is still remembered fondly to this day. Royal Mail’s superhero special stamp edition has been designed by Alan Davis, who has been working as a Marvel illustrator since 1981. 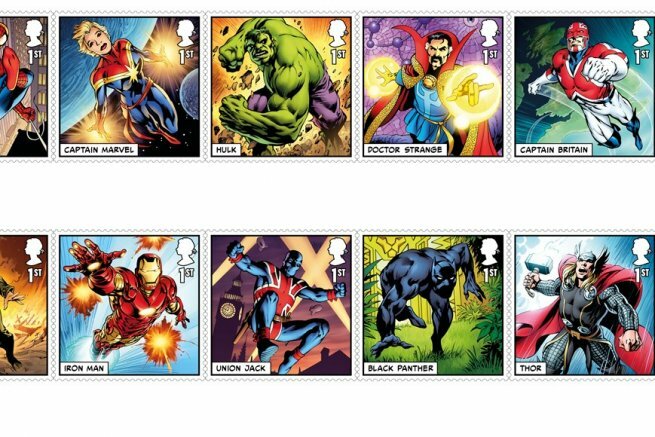 The 15-stamp set features much-loved and timeless characters including Iron Man, Thor, Hulk, Black Panther and Peggy Carter – not to mention Captain Britain himself. The Spider-Man stamp sees Peter Parker take on his enemies and save the day, thanks to his radioactive-fuelled arachnid powers. Bruce Banner’s alter-ego takes centre stage on a stamp showcasing the superhuman strength of the Hulk, while T’Challa (aka Black Panther) is the all-powerful ruler of the fictional kingdom of Wakanda. The special stamp set, which will be released on 14 March 2019, is certainly a treat for philatelists and comic book fans alike. Not only will collectors be able to purchase the 15-strong series in full, but a further 5 stamps are available in an additional miniature sheet. Also designed by Davis, this sheet depicts a specially-created story – ‘Avengers UK’ – which sees Captain Britain take on the evil villain, Thanos. Tony Lester’s next stamp auction will be held on 14 April. For more information, simply get in touch online or give us a call on 01926 270107.